Shade7's most popular cantilever umbrella, the Riviera, is receiving triple the attention at this stunning rural home in the South Island. Owners of a beautiful rural home in Canterbury have recently upgraded their outdoor space, giving it a functional yet decorative setting. Three Riviera cantilever umbrellas have been installed across an outdoor patio looking across a peaceful country section. The clever installation of the 3m square Riviera cantilever umbrellas gives great flexibility over their shade, which could not be achieved with a permanent shade structure. The Riviera’s can rotate 360 degrees and offers multiple tilt settings, giving greater adjustment possibilities to alter shade with the moving sun. Shade7 designed the Riviera cantilever umbrella themselves and since its release has been hugely popular throughout New Zealand and the Pacific Islands. The umbrella has been engineered to withstand tough commercial environments with the finest quality of materials to endure New Zealand’s harsh sun. 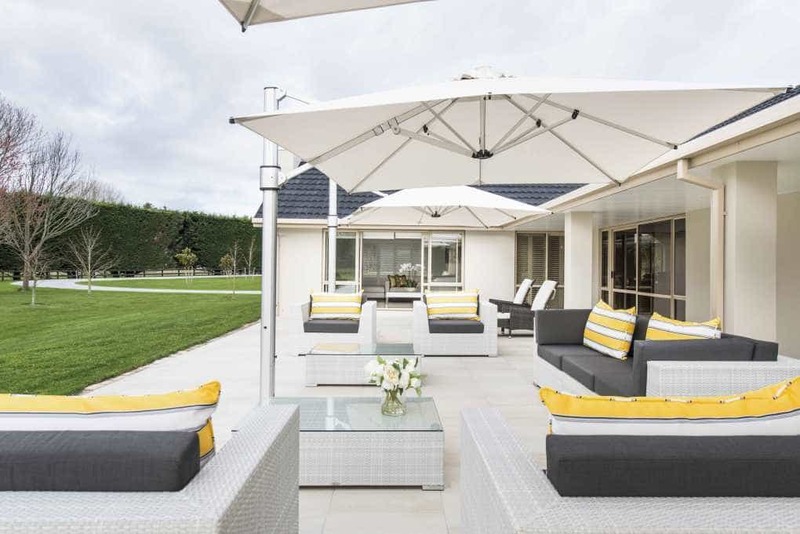 Keeping with premium quality, under the umbrellas the owners have added a large outdoor furniture lounge set from OceanWeave Furniture, giving it a real sense of luxury, colour and flair.